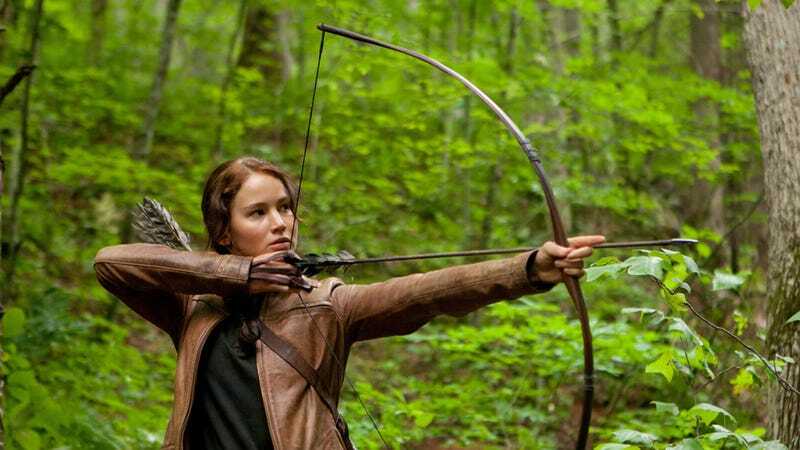 Will The Hunger Games Be The First Real Female Franchise? In a little less than two days the film based on the first book of The Hunger Games trilogy will hit the big screen. Already over 2,000 screenings on Thursday night are sold out and theatres are adding 3am screenings to accomodate the huge appetite for this film. The box office numbers that this film might achieve on opening weekend are staggering especially since the film is opening in March and is not a sequel. It is already the top selling non-franchise film on Fandango and basically anybody (92%) who is buying an advance ticket for a film on Fandango now is buying a ticket to The Hunger Games. Box office watchers have estimated it opening in the $120 to $150 million range. But there is one thing that is not a part of the larger conversation — the fact that at the center of this film is a female character and there has never been a film with a female at the heart of the story to open this big and this wide. A not only is the character a female she is a STRONG female who spends the movie literally fighting for her life. Just for a comparison, Twilight: Breaking Dawn opened on 4,061 screens and The Hunger Games will be on about 4,000. Yes, there was ONE other female centric film with a bigger budget. Salt which opened in 2010 and starred Angelina Jolie had a budget of $110 million. The budget for The Hunger Games is about $80 million. Salt which opened on July 23rd, 2010 grossed a little over $36 million on its opening weekend. The Hunger Games might have that matched by mid-day Friday. In some ways it is good that no one is really paying attention to the fact that The Hunger Games is about a girl. It makes it seem not all that important. People want to see this film because they love the story and it doesn't matter that Katniss is a girl. It is also a good thing that the love story has not been a part of the press until just this last week when people started getting talking about if they were on team Peeta or team Gale. If you remember the Twilight hype it was always about romance (cause the book is about a romance) and whether Kristen Stewart and Robert Pattinson were dating was part of the ongoing narrative. For The Hunger Games we are not getting any of that. I'm sure it is a testament to the book, but it is also a testament to the diversity of fans. But at the same time it DOES matter that Katniss is a girl and people — men, women, boys and girls — are all interested in seeing this film. This has the potential to show Hollywood where honestly it is already a hit even before it opens and finding the next potential franchise is on everyone's mind (ie the palpable interest in the fan fiction 50 Shades of Grey), that having a strong female character is not something to try and avoid, it is something to be seen as a potential success. This could be the moment where Hollywood realized how much money they are leaving at the door by not creating films that attract men AND women (including women over 25.) When women go to the movies we make films like Iron Man and Spiderman and all the other superhero films a success. They couldn't be the huge successes that they are if men and women did not attend. The Twilight films skew female and still perform really, really well. But those films were vilified for being too girly, too focused on romance, too sparkly. It made the huge numbers in spite of the fact that it was about a girl. This feels different. This film will be a huge success because it is able to attract all 4 quadrants which makes it your typical blockbuster film. It is like Batman. It will make the same numbers as a Batman or Spiderman films. Some are even saying it could be in the top 10 films of all times. That's the thing about this movie that is so revolutionary — that it is a typical Hollywood franchise film that happens to be a story about a girl. And that's why it has the potential to be looked at as a different type of franchise than the Twilight films are. Update: A couple of commenters took me to task for not giving the Twilight franchise the proper credit for making The Hunger Games a possible success. Firstly, the great news is that there is room for more than one female franchise. And yes, I will agree, The Twilight films set the table for The Hunger Games. This franchise will hopefully take a female centered story to another level. That is what I call a win-win situtation. This post originally appeared on Women And Hollywood. Republished with permission.